Mindteck Academy’s live, instructor-led Python with MongoDB online course prepares experienced and rookie professionals to be full-stack web developers. This course is intended to help the learner obtain proficiency in Python programming and develop real-world web applications using Django and MongoDB as a backend data store. The course will cover both the basics and the advanced concepts: Python Scripts, File Operations in Python, Working with Databases, Creating Views, Templates, Forms, Models and REST APIs in Django. Additionally: NoSQL Database Concepts, CAP Theorem, Applications of NoSQL Database, MongoDB® Architecture and CRUD Operations, Query Optimization and Document Structures of MongoDB. Data Modeling concepts, installation of MongoDB® and working with associated tools. 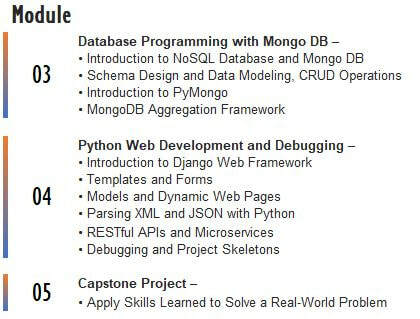 You will also learn how to access MongoDB via Python code using the popular PyMongo module. Any graduate or undergraduate with good aptitude, a flair for programming and an interest in learning Python programming. 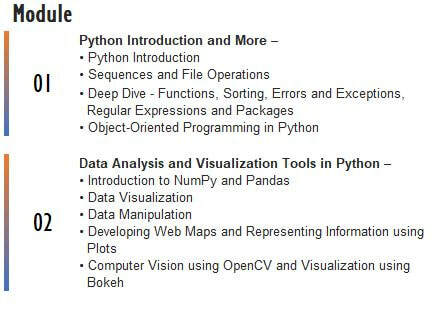 Experienced developers wanting to upskill, and those interested in learning Python, may also take advantage of this course. It is a great opportunity for all IT professionals – seasoned and new – to accelerate their careers. You will use your own computer and be expected to have a Windows 7/10, Linux or a Mac (OSX 10.10 or above) system with an up-to-date browser.